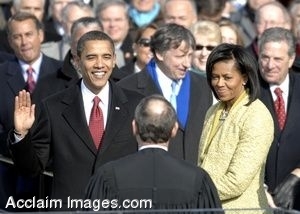 Description: Clipart Photo of Barack Obama being sworn in at his presidential inauguration. With his family by his side, this photograph shows Barack Obama being sworn in as the 44th president of the United States by Chief Justice of the United States John G. Roberts Jr. in Washington, D.C., Jan. 20, 2009. (DoD photo by Master Sgt. Cecilio Ricardo, U.S. Air Force/Released). Stock photography by Department of Defense Public Domain.